The Go Fast Campers Platform Tent takes the rooftop tent (RTT) to new heights of quality. This new RTT is lightweight, crazy thin, feature-rich, and 100 percent American made. 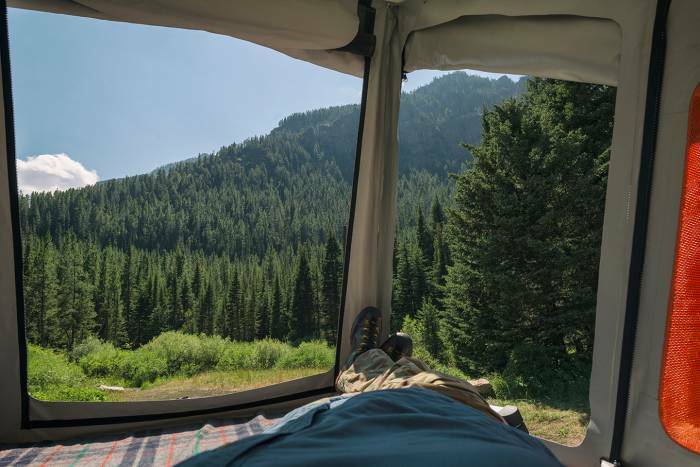 At only 135 pounds and a mere 6 inches thick when closed, the Go Fast Campers (GFC) Platform Tent is a new lightweight and aerodynamic RTT option. GFC says this is the “thinnest tent on the market.” And it is really thin! GFC also boasts “no foreign-sourced components,” assuring consumers the Platform Tent is 100 percent USA-made. In fact, everything GFC makes is manufactured in Bozeman, Montana. 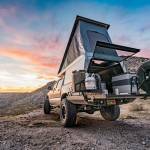 The brand started a little over a year ago manufacturing lightweight pop-up truck campers, a fast-growing segment of the overland market right now. Since then, GFC has made quite a splash in this market, now requiring a waiting list for its truck campers. 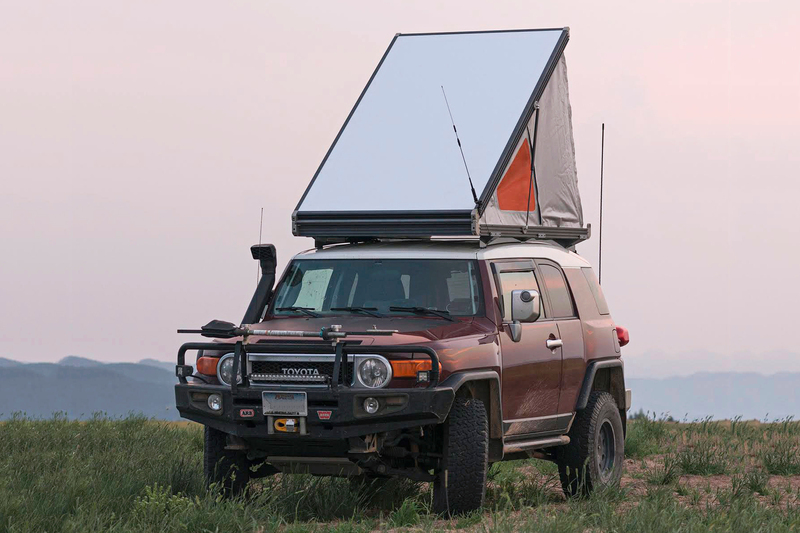 And the Platform Tent is just the next evolution of the technologies GFC developed with that truck camper. Made for serious off-road adventures, the GFC Platform Tent should be an extremely durable product. With that in mind, GFC designed every component to be indefinitely rebuildable and serviceable wherever possible. Canopy: The tent canopy is constructed with waterproof fabric and features welded construction. This construction helps reduce weight, build time, and materials. It also has no stitched seams that could leak. The massive mesh windows and doors on the tent not only offer great ventilation but also great views. Those gorgeous sunset-with-feet-sticking-out-of-the-rooftop-tent Instagram photos can now be yours! Note that the mesh windows will be black on production units, not the orange shown on the prototype. Frame: The frame, latches, and hinge of the tent are made of CNC-machined and anodized components. These high-quality parts should be extremely durable and also look extremely good. While the tent material will always be the same color, GFC will offer custom color anodizing on the tent frame. This allows you to get an RTT that perfectly fits the style and colors of your vehicle. Floor and roof: The roof and floor of the Platform Tent are made of a honeycomb composite material. This makes them lightweight and strong. The roof panel is translucent, which provides an ambient glow from any surrounding light source. It also minimizes heat transfer on hot, sunny days. Mattress: The mattress in the Platform Tent is designed for comfort and durability. It uses a 2-inch-thick multidensity foam wrapped in a Cordura fabric cover. The mattress measures 50 x 90 inches — and GFC also plans to offer different density foam options — to optimize comfort for more people. Ladder: The Platform Tent also comes with a lightweight collapsible ladder. 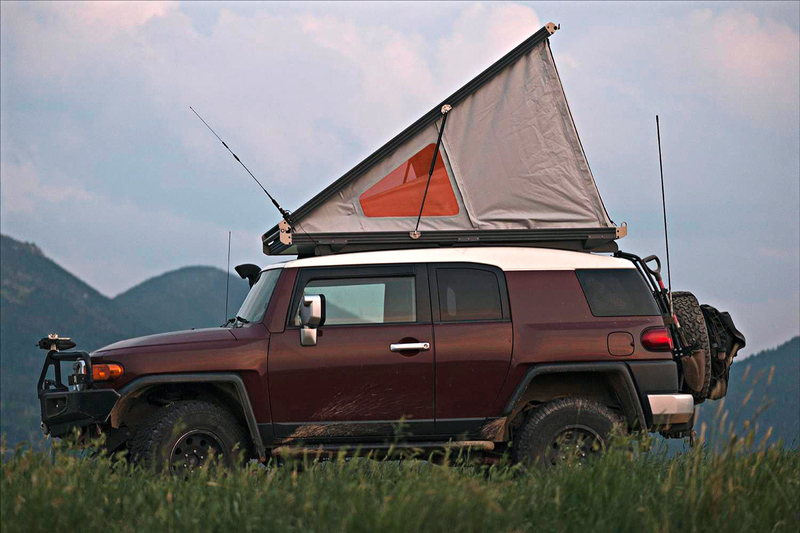 It’s made to be easily stowable and works to access both the rear and side doors of the tent. GFC worked especially hard to develop mounts that work with factory mounting points and racks already on many vehicles. While the Platform Tent can be attached to round crossbars, buying aftermarket crossbars will not be required. GFC says the entire tent assembly sits only 7 inches taller than the high point of the vehicle roof on most vehicles. This allows for much better aerodynamics, which should help with fuel economy. It also makes it easier to fit your vehicle in the garage, down tight off-road trails, and through the local Starbucks drive-thru. 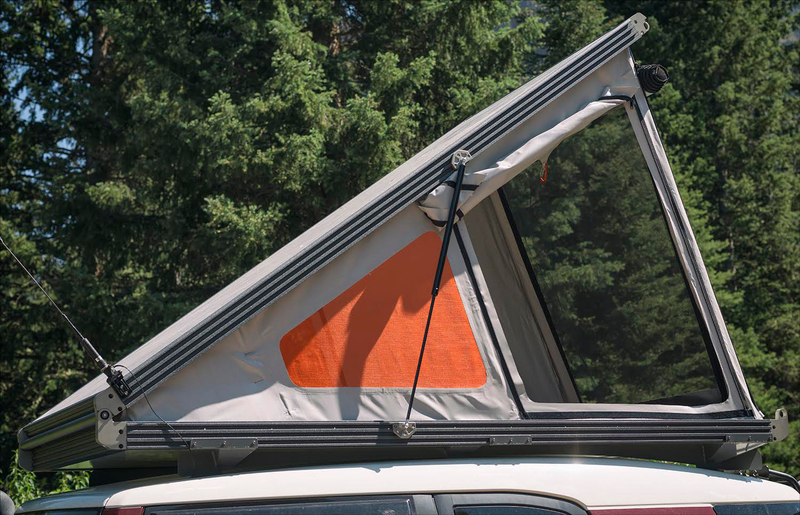 The extrusions on the sides of the Platform Tent have T-slots in them that allow a whole host of mounting options for awnings and other tools, like shovels, Maxtrax, and the like. GFC is also working on an additional rack system that will mount atop the tent. This will allow you to put up to 75 pounds of gear on top of the tent. 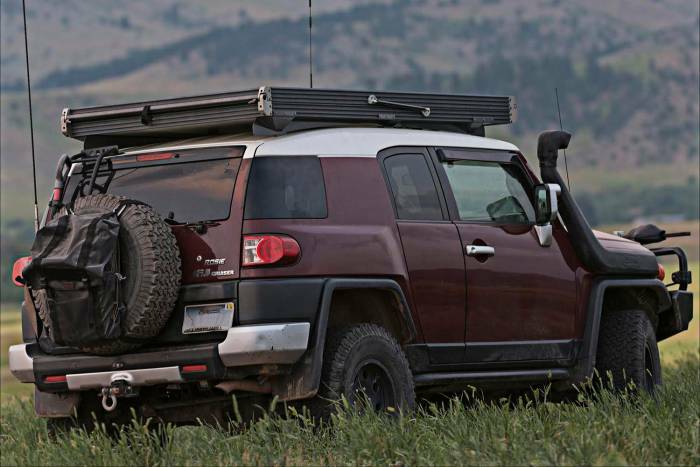 Having an RTT and the ability to store your kayaks, bikes, and other big adventure gear atop your vehicle is darn near priceless. Even better is that you won’t have to remove the gear to use the tent. While the base GFC Platform Tent will have plenty of features by itself and looks ready for adventure, there will also be a number of upgrades on offer. In addition to the roof rack in the works, the brand said electrical options, like dimmable lighting and USB charging ports, will also available soon. The base model of the tent includes a main rear door. It will be optional to add one or both side doors. All three doors are shown in the prototype pictured. The GFC Platform Tent will be sold directly from the factory. The brand will begin accepting orders and shipping tents at the end of August. The base price of this truly impressive RTT is $3,275. You can also expect an XL version of the Platform Tent to be released soon after, with a wider 56 x 90-inch interior.